The HBO Westworld series is probably one of those love it or hate it things. I’m very much on the love side, waiting for each turn of events to reveal a bit more of the tale. The second season arrives full force, reminding me of Lost in some ways. 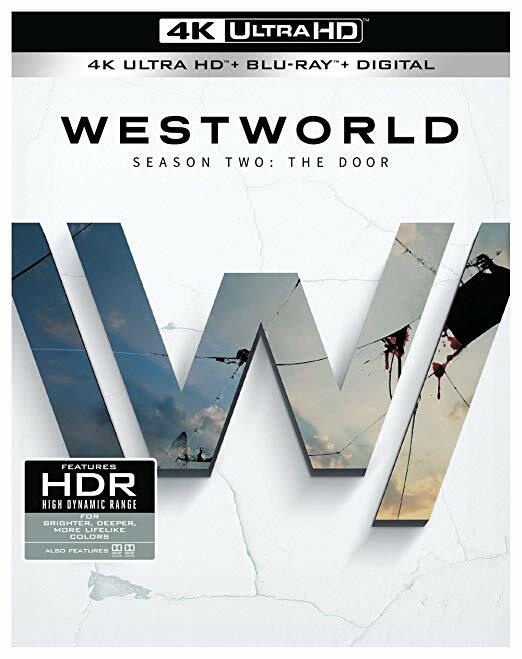 The new 4k release via WB, is a meticulously produced set, 6 discs, 3 each of 4k and Blu-ray, and like the first season is one of the reasons to own 4k playback gear. Shot on film (35/3), the second season was finished in 4k, which means that you’re seeing perfection. While some of the story may confuse, the acting is superb from all quarters, and the 636 minutes will alternatively, delight and confound. I loved the first series, I didn't get this on TV so I watched the Blu-ray set, & I'll be buying the season two set, a good excuse to re-visit the first season before starting on this. I hope it's not too much like Lost, a series that started off brilliantly, but disappeared up its own fundament as the seasons went on. It reminded me of Lost, as well – but not in a good way. I love it too. Incredibly deep smart and multilayered. I love this show but just finished the second season for the first time today. I thought I had a pretty good handle on what was going on up until the last 1/2 hour. Then I was just left with "WTF is even going on?". The first season had it's shares of twists, and upon rewatching it, everything clicked into place nicely. I don't think any number or rewatches of the second season could help me decipher it. I need a linear timeline like they put on the special edition DVD of Memento. This season seems oddly spoiler-proof, unlike season one. You literally can’t blurt out the plot without “accidentally” writing 30 paragraphs with accompanying diagrams and annotated screen captures. I've been surprised that on another forum the second season has received little love. I enjoyed it as much as the first season, with its shifting time-lines and ambiguity. The positive comments in this thread reflect my own reaction to this series much more than the negative ones elsewhere. As to those ambiguities, I found several podcasts that broadened my understanding and appreciation of each episode; most notably the podcast from Vanity Fair was illuminating. A second viewing of each episode after listening to the VF podcast was great fun. I just received my 4k copy this Christmas. I am looking forward to watching it in the days to come. One small correction…this season was also partially shot in 4-perf anamorphic. The bulk of the show is 35/3 at 1.78:1. The usage of anamorphics was context specific. I believe the anamorphic stuff was just when Bernard went inside <SPOILER>'s program. I haven't watched the discs yet, but my memory of that opening scene (from earlier this year) is that it is set where the others are, and the aspect ratio is the "tell." Intend to purchase season 1 & 2 on 4K UHD Blu-ray! Also lest we forget, Ms Newton won an Emmy Award for best supporting actress for this season.